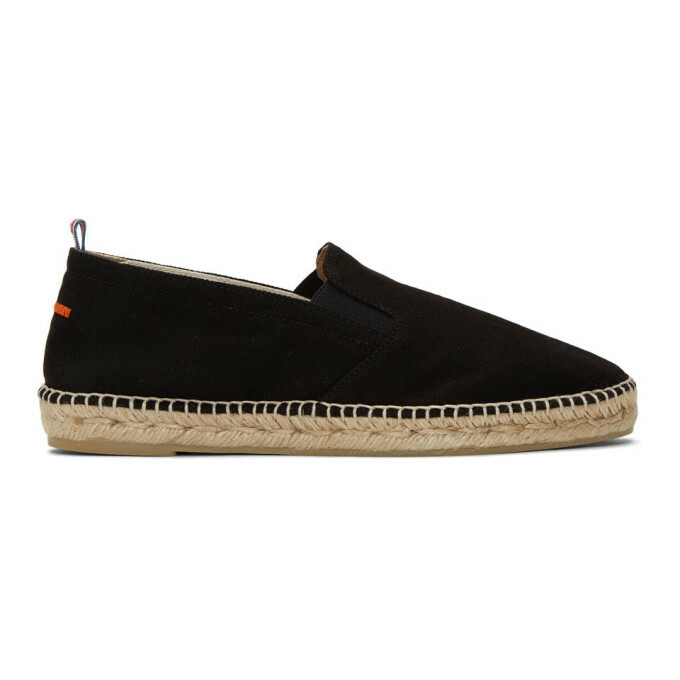 Canvas espadrilles in black. Round toe. Elasticized gussets at sides of tongue. Grosgrain pull-loop striped in blue, white, and red at heel. Orange stitching at heel collar. Blanket stitching at welt. Braided jute midsole. Rubber outsole in tan. 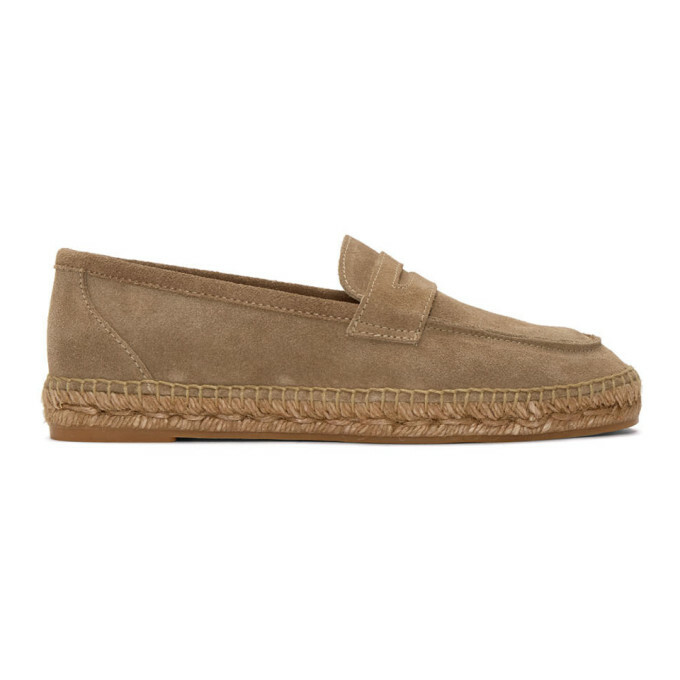 Suede espadrilles in 'mink' brown. Round toe. Tonal trim at vamp. Blanket stitching at welt. Braided jute midsole. Rubber outsole in tan. Suede espadrilles in 'mink' brown. Square toe. Grosgrain pull-loop striped in khaki and beige at heel. Orange stitching at heel collar. Blanket stitching at welt. Braided jute midsole. Rubber outsole in tan. 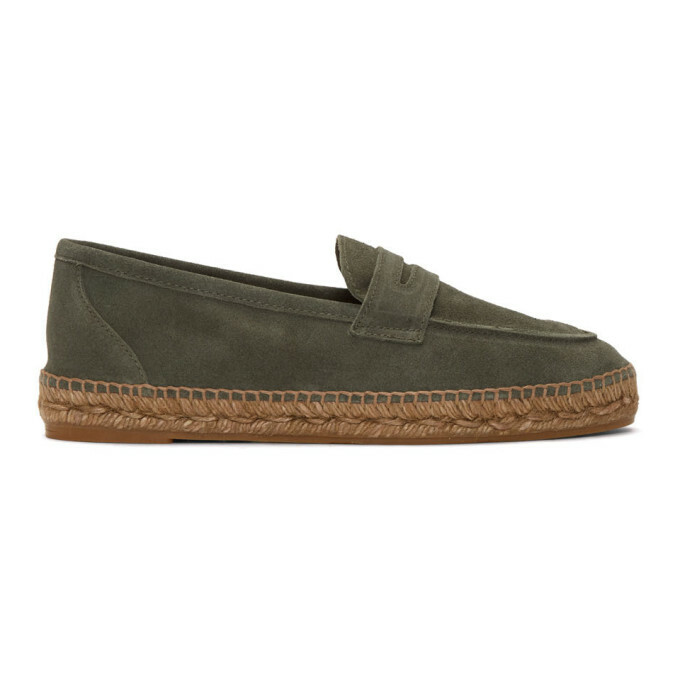 Suede espadrilles in 'olive' green. Round toe. Tonal trim at vamp. Blanket stitching at welt. Braided jute midsole. Rubber outsole in tan. Canvas espadrilles in 'pearl' grey. Square toe. Grosgrain pull-loop striped in blue, white, and red at heel. Orange stitching at heel collar. Blanket stitching at welt. Braided jute midsole. Rubber outsole in tan. 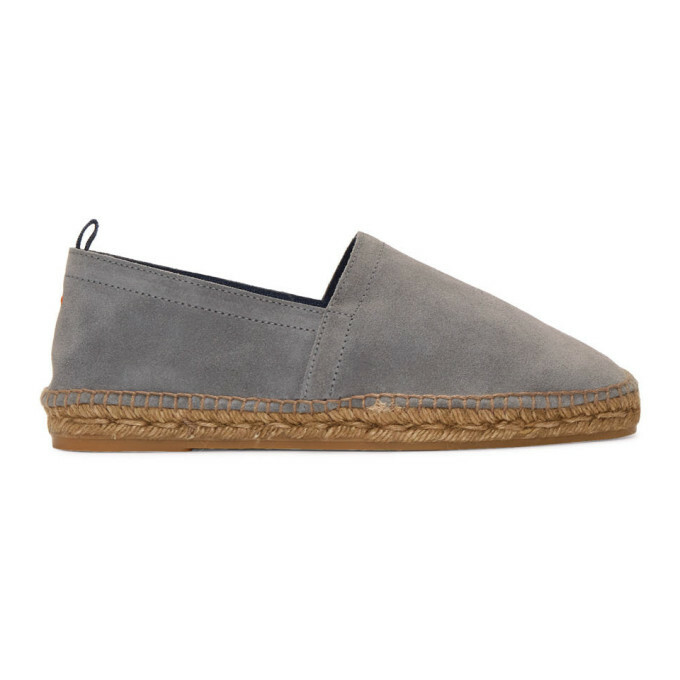 Suede espadrilles in 'clear' grey. Square toe. Grosgrain pull-loop striped in blue and black at heel. Orange stitching at heel collar. Blanket stitching at welt. Braided jute midsole. Rubber outsole in tan. Suede espadrilles in navy. Square toe. Grosgrain pull-loop striped in blue and black at heel. Orange stitching at heel collar. Blanket stitching at welt. Braided jute midsole. Rubber outsole in tan. 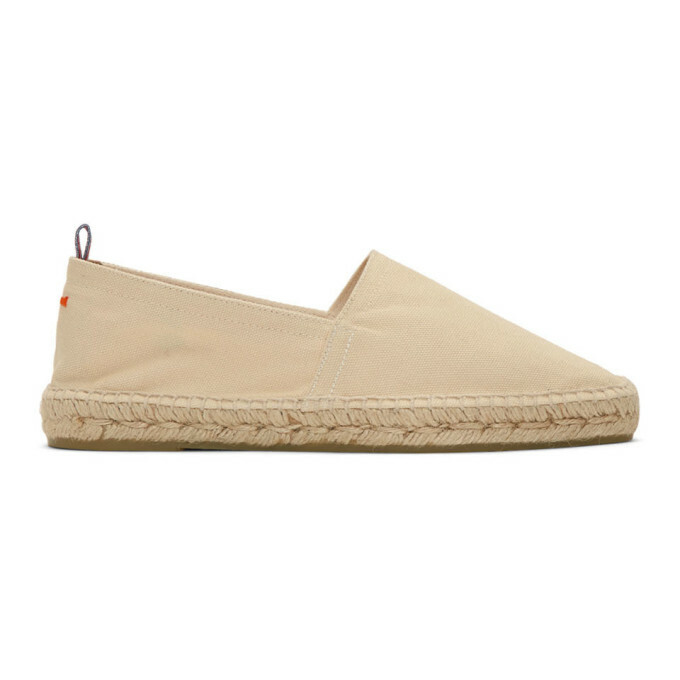 Canvas espadrilles in 'ivory' off-white. Square toe. Grosgrain pull-loop striped in blue, white, and red at heel. Orange stitching at heel collar. Blanket stitching at welt. Braided jute midsole. Rubber outsole in tan.